How do I cancel my paid RealTimes subscription? 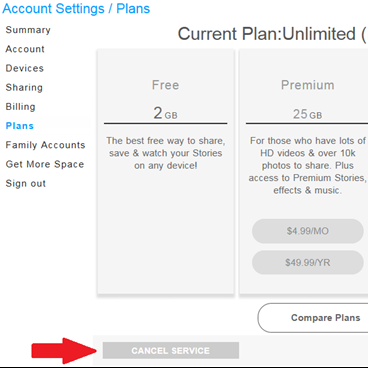 If you signed up for a paid RealTimes plan on your PC, access your account at https://realtimes.real.com/myaccount, click Plans, and then click the grey Cancel Service in the bottom left corner of the screen (as indicated by the red arrow in this screenshot). If you do not see this button, then it's likely that you either have a free account (so there is nothing to cancel), or you subscribed via Google Play or the Apple App Store (iTunes). Deactivation deletes your account and all associated content. Currently, account deactivation is only available to free RealTimes users that do not have a purchase history with RealNetworks. If you have a paid subscription, you must first cancel it and wait for the paid term to expire before you can deactivate your account. If you want to deactivate your account and remove your content, click the Deactivate Account link next to Account Information on your My Account page. For paid users, canceling a subscription stops further charges to your credit card or other payment method; also, at the end of your paid subscription, your Cloud storage space will be removed (or in some cases reduced to 1 GB). Will I get a refund for unused time? We do not offer refunds. You will maintain the same level of access for the duration of the time you have already paid for (the rest of the month or the rest of the year). When your paid time is up, your subscription will not be renewed; no further charges will be processed once you cancel.